CHERRY HILL, NJ, January 28, 2014 – AmeriQuest Business Services welcomes Marcus Luttrell, retired U.S. Navy SEAL, hero, and author of the best-selling book “Lone Survivor” as one of the keynote speakers at the 2014 AmeriQuest Symposium at the Ritz-Carlton Orlando Grande Lakes February 19-21. 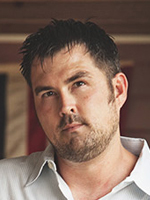 Marcus Luttrell’s book, based on the real-life mission of his SEAL team to carry out a mission in Afghanistan to kill or capture a high-ranking Taliban leader, has been made into the current film “Lone Survivor,” starring Mark Wahlberg as Luttrell. He will speak on February 21 on the values of training, sacrifice, courage and honor, reflecting on the action in which his team members were killed and he was seriously injured. The second keynote will be Ram Charan, world-renowned business advisor and author, who has worked with Fortune 500 companies such as GE, Bank of America, DuPont, 3M, and Verizon. His real-world solutions and strategies will give Symposium attendees a clear understanding of economic conditions now and in the future and how to deal with them. Charan is the first keynote speaker to be invited to appear twice at the AmeriQuest Symposium, which was inaugurated in 2003.